Thank you to all who came out and participated in Southeast Feast 2018! ​Southeast Feast and Alaska Wild Salmon Week was a huge success! We’d love to hear from you about the event - fill out our feedback form. Please help us thank all the amazing volunteers, business partners and sponsors who contributed to making this event and week possible. An especially big thank you to Devil’s Club Brewing Company and Amalga Distillery for their amazing staff, beautiful spaces, and dedication to local ingredients and healthy salmon. A huge thanks to Taku River Reds and Tyson Fick for their awesome support and beautiful salmon, and to Hank Shaw for his guest appearance and delicious salmon balls recipe. Barnacle Foods’ Matt Kern and Lia Heifetz have been long-time passionate advocates for the campaign and we’re so thankful for their amazing kelp products and their awesome shucking team! And thanks to Art Sutch for photographing the event and to Kelsey Fagan for her gorgeous hats, and to both her and Foggy Mountain for their very generous donation during the event. We love seeing the hats all around town! ​Do you want to take part in sponsoring next year's event? Let us know! 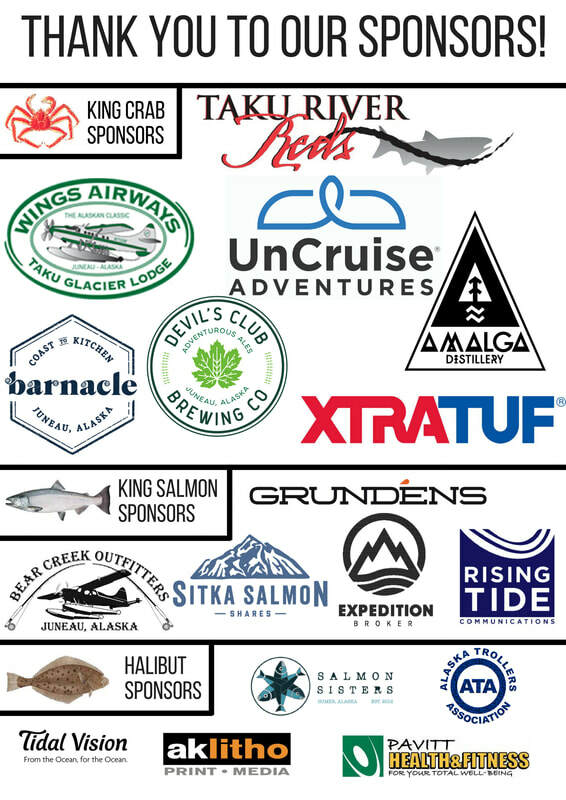 In addition we had a number of businesses in Juneau sign on to not only celebrate all week for Alaska Wild Salmon Week (August 6-12), but also to donate directly to salmon by contributing to the Salmon Beyond Borders campaign. Thank you to Alaska Fly Fishing Goods, Coppa, Deckhand Dave’s Fish Tacos, In Bocca al Lupo, Pier 49, SALT, and Trickster Company! If you’re as fired up about this issue as we are, please consider volunteering! Whether it’s helping us with an event, writing an OpEd, or hosting a home showing of a short film, volunteers are an important part of this campaign. Simply reply to this email or fill out this form.